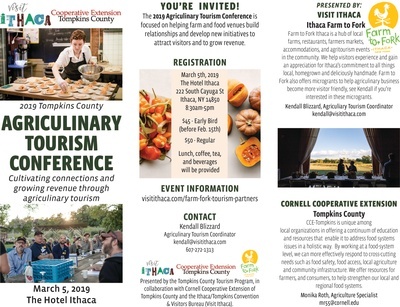 The Tompkins County Tourism Program, in collaboration with Cornell Cooperative Extension of Tompkins County and the Ithaca/Tompkins Convention & Visitors Bureau, is pleased to announce our 2019 Agriculinary Tourism Conference focused on helping farm and food venues build relationships and develop new initiatives to attract visitors and to grow revenue. Becker Farms and Vizcarro Vineyards, located east of Buffalo, NY, is a 5th Generation family owned 340-acre working fruit and vegetable farm that sells most of their products directly to the public at their farm. Becker Farms has steadily expanded their agritourism activities to include a farm store and bakery, winery and brewery; school tours and activities for kids; event space for parties and weddings with a farm to table menu; and lodging. This provides a unique setting for visitors to connect, explore, experience, taste, shop and stay. Mindy and Oskar will talk about the evolution of their farm from when they began to a full service agriculinary tourism destination. 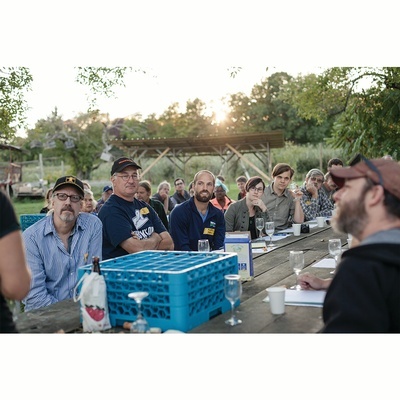 Our panelists of chefs and farmers will share experiences of working together to integrate seasonal produce, local meats, and artisan products into menus. Panelists will discuss logistics and tips for this unique selling arrangements. Private events such as weddings, present unique challenges. 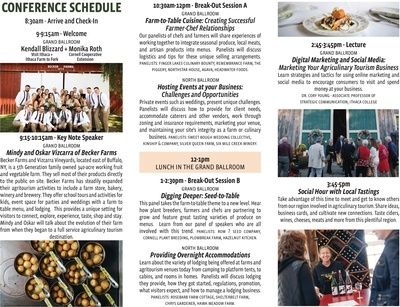 Panelists will discuss how to provide for client needs, accommodate caterers and other vendors, work through zoning and insurance requirements, marketing your venue, and maintaining your site's integrity as a farm or culinary business. Gordie Gallup - Silver Queen Farm, venue & working farm. This panel takes the farm to table theme to a new level. Hear how plant breeders, farmers and chefs are partnering to grow and feature great tasting varieties of produce on menus. Learn from our panel of speakers who are all involved with this trend. Learn about the variety of lodging being offered at farms and agri-tourism venues today from camping to platform tents, to cabins, and rooms in homes. Panelists will discuss lodging they provide, how they got started, regulations, promotion, what visitors expect, and how to manage a lodging business. Learn strategies and tactics for using online marketing and social media to encourage consumers to visit and spend money at your business. Take advantage of this time to meet and get to know others from our region involved in agriculinary tourism. Share ideas, business cards, and cultivate new connections.